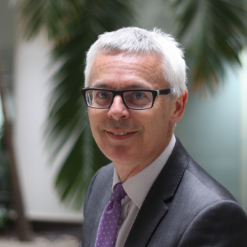 Jonathan Slater, Permanent Secretary, joined the Department for Education in 2016, with a real interest and passion for inclusion. He has made a commitment to actively seek to increase the diversity of the department’s workforce at all levels, including senior roles. He is the board sponsor for the LGBT+ Network, meeting regularly with the network, and has championed the introduction of gender neutral toilets in the department’s Coventry, London and Nottingham offices. He has been pushing for more inclusive procurement, as well driving a number of key cross-government issues forward. These have included engaging with Civil Service Employee Policy (CSEP) to create LGBT+ inclusive guidance for use across the entire civil service and the introduction of the ‘Mx’ title on the department’s HR system. He is the first Permanent Secretary to attend the Stonewall face-to-face feedback meeting to hear first-hand about how the department might build on the positive work that has already been started, learn about best practice and lead change.